I'm a bit behind in farm blogging. I worked three days last week substituting at my school-year job, and that was quite time-consuming. Lots is happening on the farm. Adam has been scything and mowing, not just to keep things under control, but to resume the all-important process of making mulch and compost. I'm starting asparagus in the greenhouse. It's like a tiny forest of trees in tiny pots. 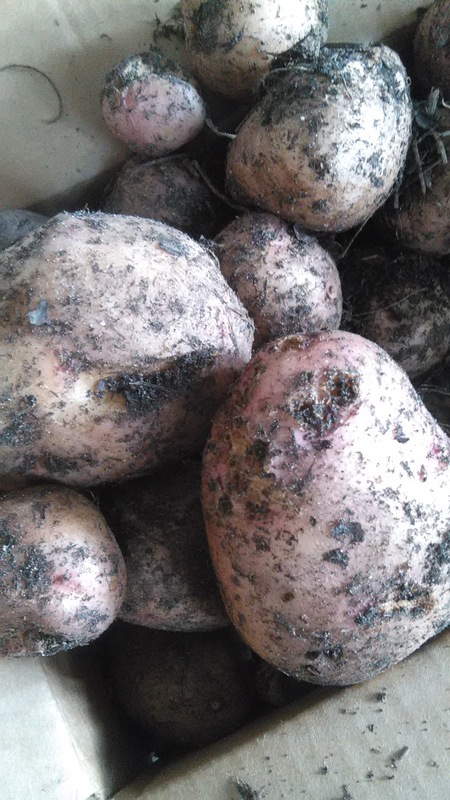 We dug up all the potatoes. We probably broke even -- planted about ten pounds and harvested about ten pounds. Adam listened to the noisy voices online about how to do potatoes in a bin. Later he learned that potatoes like to grow down, so you should place them in the top of the bin, and they will produce potato tubers as the roots descend. We will try that ... later. So we didn't lose any money, and we gained information and experience. Our few pepper plants are beginning to bear. 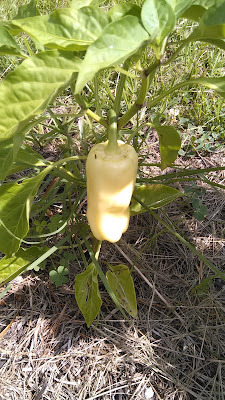 This is a strange albino one. The others are green. 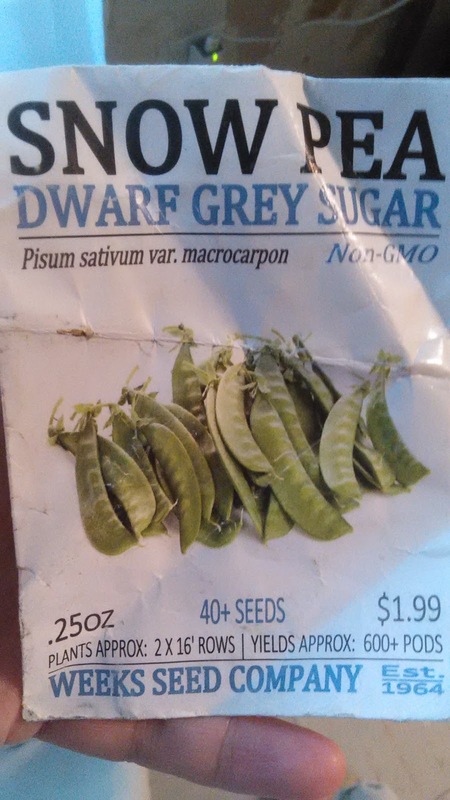 While sorting through stuff on his dresser, Adam found the seed packet for the delicious sweet peas we put in. Now I know! Snow peas. Well, we will look for the same kind next year. This is a fun-looking gourd growing. The pattern reminds me of some computer code. 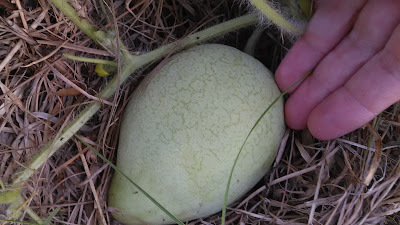 We have a nice watermelon coming along. Haha! 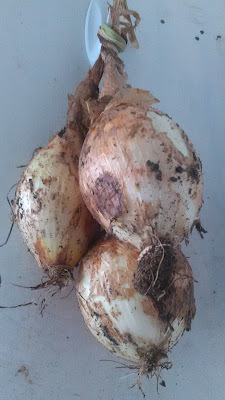 Some scrap of onion from the kitchen decided it loved growing in the compost. Yellow Pear -- bearing very well. They were hard to grow in the greenhouse and didn't look like they'd thrive, but in the ground they've done very well. Good flavor and very pretty. Garden Peach -- great flavor and sturdy texture. Again, a plant that seemed peaked in the greenhouse but has done fine in the ground, and everybody loves the juicy, meaty fruit. Juliet -- the only non-heirloom we grew. A good small-plum size for salads, good flavor, producing a lot right now, which is very helpful for the early season when the other tomatoes aren't in full swing yet. Mini-Orange -- such a pretty fruit! Another one that was tricky to handle in the greenhouse and seemed sickly. But it might be worth it for the pretty fruit. Cherry Chocolates, Black Cherries, and Black Plums. I'm not sure why but these darker varieties don't seem to have the sharp tomato flavor you look for. The Cherry Chocolates in particular are just not great. They are okay for making into a sauce because they have flesh and volume, but not much flavor. I thought the CCs would be great because they germinated early and grew well in the greenhouse. Live and learn! Adam is scything on wet mornings; the scythe needs moisture on the tall grasses in order to work well. He's hauling all the cut grass into the garden to mulch the area. As it reduced, it also enriches the soil there. 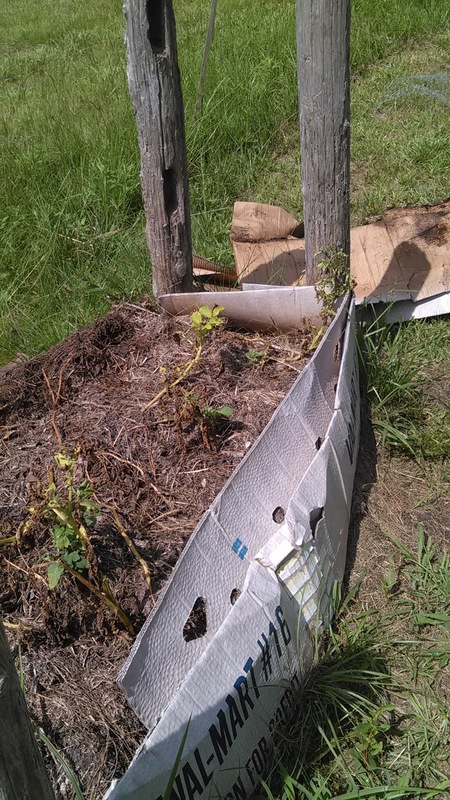 He has a bit of last year's compost left to begin an asparagus bed when we're ready for it. 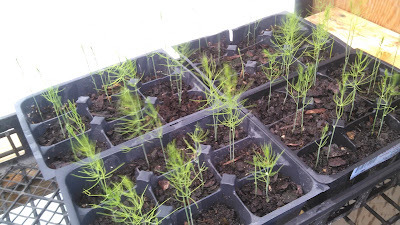 The asparagus plants are pretty small still. We've improved our chicken area. Adam strengthened the fencing. 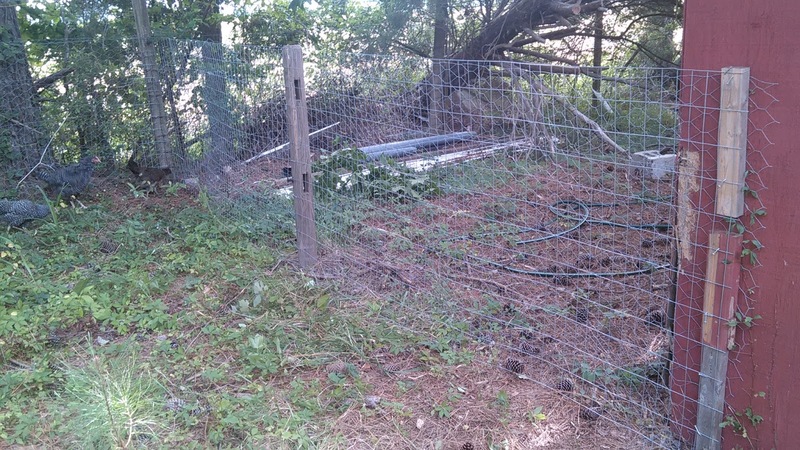 This is the first stretch of fencing along the alleyway to get into the coop. It was just chicken wire. 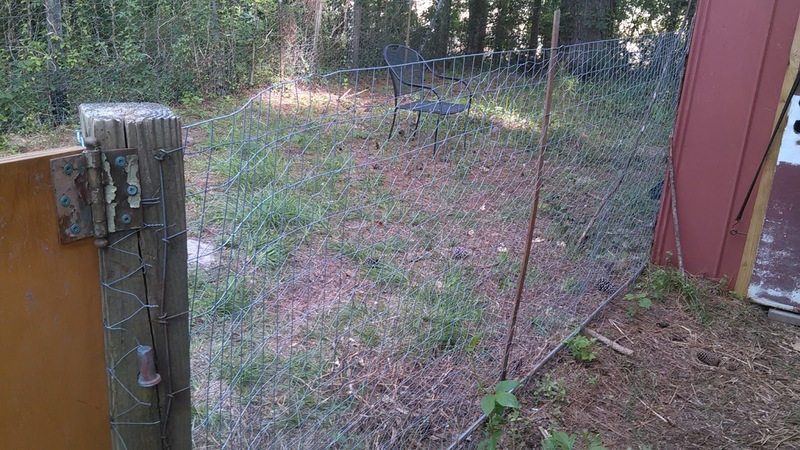 He added 4x2 wire fencing. The more important stretch of fence was in the back. This is where I worry predators might come from. 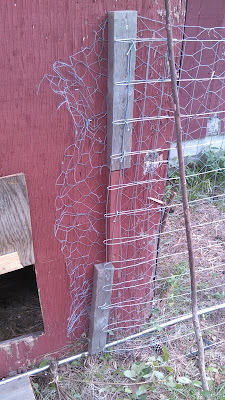 This is also now 4/2 wire with chicken wire. We could tell that something -- we don't know what -- had gotten into and out of the chicken yard at this corner. 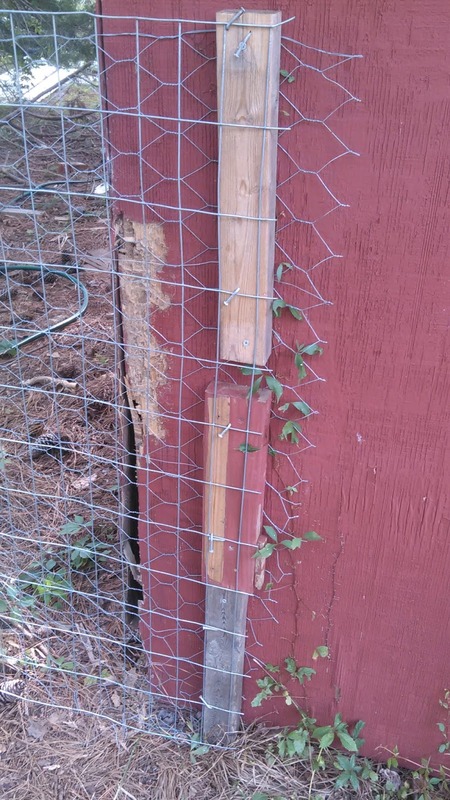 Adam secured it better with these boards and screws. In addition, he added another wooden door between the main field and the alleyway. 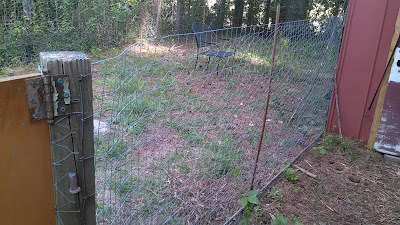 The chicken wire gate there did not keep out our dogs. Today he's changing the roost arrangement too. 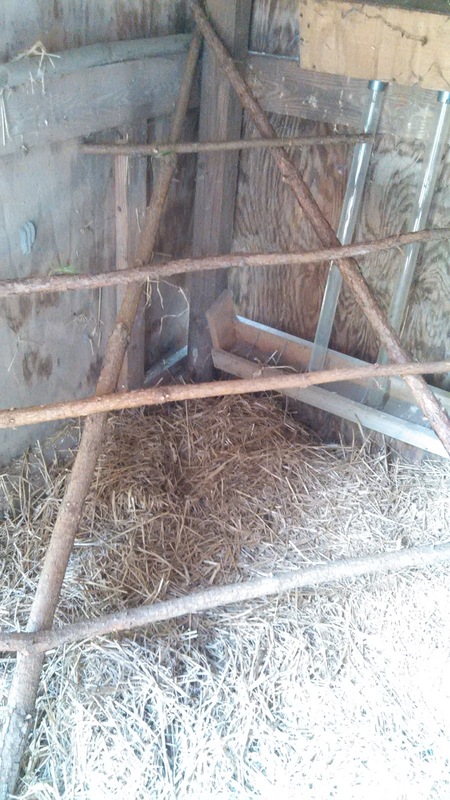 All four hens would climb to the top of the triangle roost and perch together there -- squeezed in. Bernie would climb on top of the old feed box and sit precariously on its slope. 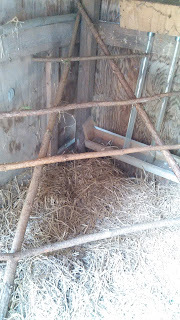 Anyway, I'll share later about what he did to this roost. I wanted them on a lower roost, and not all squashed together. I wonder if the hens will comply? Knowing hens, probably not! You're learning so much, working SO hard! I like that watermelon. Part of life is learning and growing, and with farming life, it is multiplied. You two are doing GREAT. Your garden looks fantastic! Reminds me that I need to go dig our potatoes too. 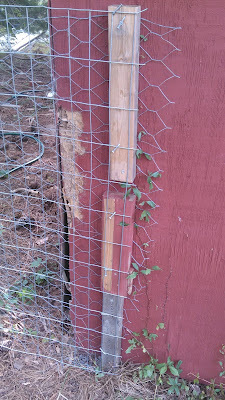 Adding that wire to the chicken wire was a good idea. (We have "hardware cloth," the wire with holes too small for black snakes to get in. They are chicken killers. I found that out the hard way.) Excited about your getting chickens! Mine are well; the four-month old hens will be laying eggs in a few more weeks. Interesting discovery in the last two weeks --- two of the hens turned out to be roosters! Helen Crump is now Floyd Lawson, and Mrs. Mendelbright is now Goober! Your crops excite me so much! That gourd (what IS a gourd? 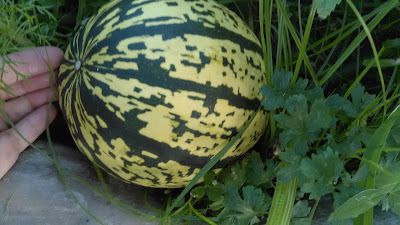 Is that the American name for a Squash?) and the watermelon are amazing!! !